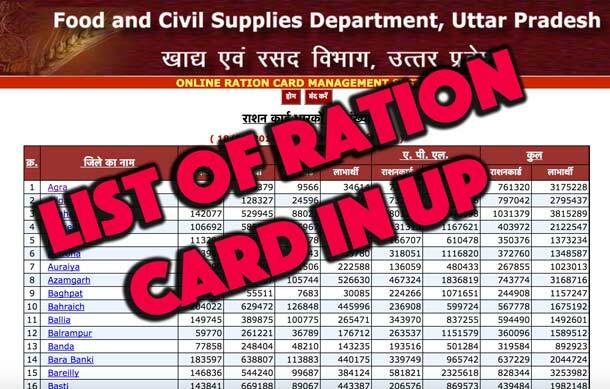 Ration Card Information, Find Ration Card 2017: Latest Ration card list has been issued by Uttar Pradesh Food and Civil Supplies Department. Check your latest family ration card details here. Anyone who want to check their new card can find it in the list provided below. If you have recently applied then it will not be in the list of holders it takes time to get your name on it after verifying the details. All the links are from UP government official website. It is updated daily or weekly sometimes. Depends on the work of the government official. Click on the link of your respective District to get the new list of digital ration card given in below table. UPRASHANCARD Note:: All the list generated here is taken from UP state government website. You do not need to apply new ration card if your name is on list. The list gets on updated periodically, always keep an eye on it. If you have applied recently and your name is not on the list then there is possibility your card may come up later in future. This facility of ration card is given only to poors so please make sure you make ration card only when you are needy or if you have ration card, use it to give benefits to the poor. Many poor people are unable to get ration cards so you can help them by getting a ration card and let them use your card to buy ration for cheap. If you any question regarding the digital up ration card new list you can ask us in comments box below. If you have any question regarding any other state or union territory you can also ask us, we will try to help you as soon as possible. Dhanyawaad! When did you applied for it? Did you applied online or offline. Was it for Uttar pradesh or any other state? Currently in ration card website all links are not opening as they are revamping the website. Also ration card online form is not available. For offline filling of your ration card please visit your nearest food and civil supplies (fcs) department. Sir namaskar.Mera ration card no.256*214610035280 hai.Ration vikerta kahata hai ki list mai aap ka naam nahi hai.please batayen ki mai kya Kari.thank you. Ration card list mein mera naam nai hai. Maine pichle saal aanline bharwaya tha faram. Ab kese banega mera rasan kard? Aapke paas raseed (receipt) hai? Online bharne k baad ek receipt mili hogi. Mera bhi aisa hi hai, Maine Apply kiya tha receipt bhi hai leking online show nahi kar raha hai. kaise pata kare please bataye. Mere paas hai, Kaise check kare please bataye. Maine onlile apply kiya tha mere pass receipt bhi hai leking mera name show nahi kr raha hai. What are the major commodities given under PDS to Ration card holder in UP ? चीनी रू0 13.50 प्रति किग्रा0।"
What are major compulsory commodities given under PDS to Ration Card holder in UP ? Shukriya. Keep visiting daily for latest information. If you need any type of related to the website you can comment here. DEAR I FILLED ONLINE RATION CARD, AFTER THAT A SURVEY ALSO HELD LAST YEAR BUT TILL NOW I HAVN'T RATION CARD WHAT CAN I DO??? Try contacting your nearest rashan card management department. fcs.up.nic.in National Informatics Centre (NIC) is not updating my ration card. I have applied for it when online procedure of application the rashan cards started. Please help me. I don't get you what your are trying to say. Agar apko english m problem ho rahi h toh aap hindi m likh sakte hain. Apne online check kar liya hai? Agar online hai toh usi ko print kar k laga dein. Bahi toh apne nazdeeki food and civil supplies department m ja k contact karein. Currently, online application of ration card is closed by the up govt. When the service of online application comes up. I will update this page. Till then keep visiting to know when online applications of rashan card is started. Government procedures are always typical. What problem are you facing bro? Website is opening. Give me your details. If you can tell under which shop your ration card comes I can get you the download link of online ration card. then let me know. Give complete details if you want it. Bahut logon ka ration card nahi aaya hai jinhone online karaya hai. Apne nazdeeki fcs up department se contact kariye. Sir this Sunil Kumar . My mother applied for ration card but ration card not not got yet. Plz tell me what I do.and not find the name in list . Old ration card no. Is 114010313167. PLease contact the nearest pds or fcs department. Lots of online ration card have not been renewed or get verified. The easiest way is to contact a notary and ask him to get the ration card made. They charge some money but they know all the procedures in government departments to get the ration card. My name in the new list 2016 is not found. Please help me. I tried searching ration card details by name but it is not found. Wait for the 2017 ration card list. ऑनलाइन शिकायत प्रेक्षित करें टोल फ्री नंबर: 1800 1800 150 <--- is number pe call kr k shikayat darj karein. UP ke 2017 rashan card list mein naam kaise aaega? Kya purana wala nae wali list m aajata hai. Currently there is no procedure to correct name details online. Election k baad agar dobara net se ration card bharna shuru hua toh ho jaega shayad. Sir mene apna rasan card banaya tha computer wale se. Lekin abhi tak rasan karad nahi aya hai. Kese banega. Bhayya aur states ka bhi ration card ki jaankaar dedo. Rajasthan, Punjab, Bihar, Madhya Pradesh aur New delhi ka bhi. You have to contact your nearest food and civil supplies fcs department for getting the details of your new ration card application. Sir please help me your site is not working so good when i touch the Drop down menu for searching new list of rashan card .... it is not working.. It is working. please check. Please make sure you are using it on a latest web browser. Sir mere yaha kasiya khesari Gidaha me kotedaar Ashok ke dwaara jyaadatak logo ke ration card me unit add nahi kiya gaya Hai iske samadhan ke liye koi upay bataye pls. apne kareebi food and civil supplied department m ja k contact karein ya phir kisi notary se contact, un logo ka iska sahi procedure apke zila m kya h pata hota hai. Thank you sir for the information of rasan kard.